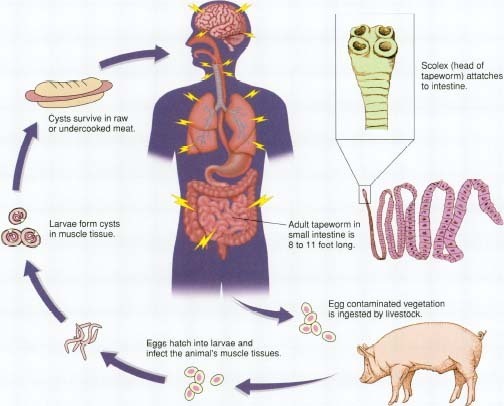 Life cycle of the pork tapeworm. Credit: Advameg, Inc.
Sacculina infecting the Shore Crab, Carcinus maenas. A parasite is an organism that lives in or on the living tissue of a host organism. It gives its host nothing beneficial in return, and often is injurious and even lethal to the host. Parasitism is in contrast to symbiosis, in which both organisms benefit from their association. A parasite must remain in close contact with its host. It depends on the latter for its food and is unable to live a free life for very long. This is because most parasites have become thoroughly adapted to a parasitic existence. In doing so they have often lost the power of locomotion, their sense organs are reduced (they do not meet the changing conditions that a free-living animal does in exploring its environment), the gut may be reduced or absent, and the reproductive system has become greatly developed. This is important because, in order for the parasitic species to survive new hosts must be contacted. The greater the number of offspring the better is the chance that this will happen. This adaptation may be compared with that of a parasitic flowering plants, such as dodder, in which the vegetative parts are very reduced. The energy saved in not building those parts is used in the production of numerous tiny seeds. It seems probable that the ancestors of present day internal parasites lived on the outside of their hosts. Over millions of years and by way of many minute structural changes they became adapted to a life inside their hosts. In this way the habits of today's internal parasites evolved so that some now invade the innermost parts of the host. Inside another animal a parasite has many things to gain. It is generally immune from the attacks of other animals and from inclement weather. Whether in the blood stream, gut, or cells of its host it is surrounded by a ready supply of already digested food (hence the lack or reduction of digestive organs.) Its main concern is to take sufficient food for itself without killing its host. Before its host does die of other causes the parasite or its eggs must pass to the outside world in order to come into contact with another host. The adults of most internal parasites die before or with their hosts. The eggs pass outside the host and the larvae into which they develop often infect another completely different host species. The beef tapeworm, for example, infects both cattle and humans. It is said to have a two-host life history. Some parasites infect three different hosts. Many parasites (e.g., tapeworms and hookworms) possess hooks or suckers with which they can hang on to the gut lining of their hosts. Fleas and many lice have claws on the ends of their legs with which they can cling to the feathers of birds and the hair of mammals. Gut parasites are able to survive in conditions where there is very little (if any) free oxygen. No doubt the fact that they are surrounded by food and therefore have to expend little energy to obtain it enables them to exist on a minimum of oxygen but even so, these are conditions in which few free-living animals are able to survive. The nematode Acaris, and tapeworms too, are able to resist the effects of their host's digestive enzymes, and yet at the same time can avail themselves of the digested food. One parasitic barnacle, Sacculina, was only recognized as a barnacle when the details of its life history were worked out. Its larva attaches itself to the outside of a crab and having spread through the tissues of the crab may appear as a yellow, rounded mass on the underside of a crab's body. It is then little more than a mass of germ cells. 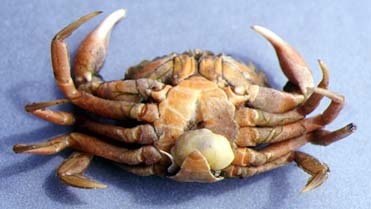 Though the crab may eventually recover from the attack of Sacculina usually the parasite reproduces and many young barnacles are then available to infect fresh hosts. The habit of the female cuckoo of laying its eggs in the nests of meadowpipits, hedge sparrows, and reed-warblers is well known. The cuckoo youngsters push the foster parents' eggs out of the nest and are fed by their foster parents. A parasite that lives in the host is called an endoparasite; a parasite that survives on the hosts exterior is an ectoparasite. Many parasites, such as protozoa, fleas, and worms, carry disease or cause sores or lesions which may become infected. The European cuckoo and cowbird rely on other birds to rear their young, and are therefore considered "brood parasites". In parasitoidism, the relationship results in the death of the host. For example, various flying insects, such as the ichneumon flies, lay their eggs on or in a host which becomes food for the insect larvae. A hyperparasite is one that parasitizes another parasite. Most parasitic animals belong either to the Protozoa or to the various groups of worms, particularly the flatworms and roundworms. Quite a number of tiny crustaceans and insect parasites are also known. All the groups of vertebrates, and many invertebrates too, are known to be attacked by protozoans of one kind or another. Monocystis, for example, lives in the reproductive organs of earthworms absorbing the fluid surrounding it through the surface of its body. Its life cycle is complicated but it is probably passed on to other worms when the latter eat soil containing bird droppings., the infected worm having been eaten previously by the bird. Malaria parasites and trypanosomes (both similar to those that attack humans) are found in birds. The former destroy the red blood cells while the latter live in the bone marrow and lymph system. Flagellates (protozoans with flagella) are also found in the gut. Lice and fleas, among insect parasites, and mites and ticks are common on birds and mammals. All are adapted for life on the outside of their hosts, feeding on the feathers or hair, or sucking blood. The larvae of warbleflies are parasites of economic importance. They are parasitic in the bodies of mammals and cause considerable damage to the skin of cattle, thus seriously reducing the worth of their hides to the leather industry. One wingless fly, Melophagus (commonly called the sheep tick), is parasitic on sheep, another on bats. The larvae of tachinid flies are parasitic on the larvae of moths, butterflies, beetles, and bugs. The flatworms (or Platyhelminthes) and the roundworms (Nematoda) have specialized in parasitism to a greater extent than any other groups. Among the flatworms, the flukes and the tapeworms are all parasitic.